Perhaps the most difficult task of staying afloat in our increasingly contentious, politicized environment is maintaining clarity. Dividing and confusing us is the Left’s most powerful tactic, the means to their evil ends of controlling us. Without the bedrock of agreed-upon definitions and the meaning of words themselves, we are lost. The only alternative to physical combat and bloodshed is debate, ideas. Without words and the ideas they specifically evoke, there is no debate. Thus, we are left with both the bad news…and the good news: he who controls words and their meanings controls the culture. First and last, know and repeatedly acknowledge your enemy. 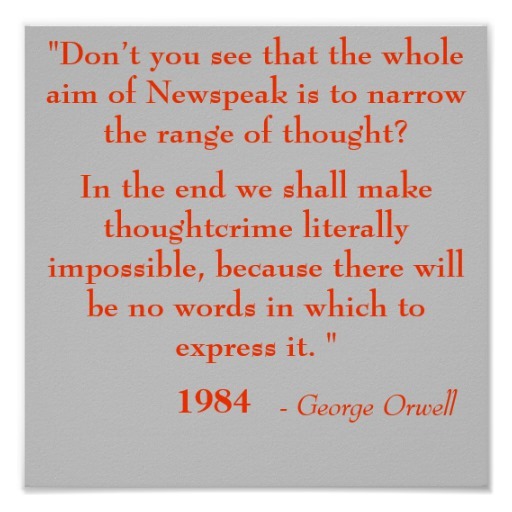 Orwell, in describing newspeak, doublethink, memory holes and other nightmares of semantic terrorism, described the sinister corruption of language as perhaps the most powerful way to destroy individuality, crush souls, bring the masses to heel and establish a permanent, totalitarian society. In the worlds of “1984” and “Animal Farm” freedom is really slavery, peace is war and good is actually bad, whatever those crafting the narrative deem them to be for that moment. In such a world, there is no objective reality, no facts, no agreed-upon truth, no concrete reality, no reliable touchstones (to be altered at one’s convenience), particularly if one is in the political business of corralling souls into a docile herd. In short, there is no God in this world of fluid reality, no ultimate power higher than man to which one can turn. No higher, that is, than the State. One case in point: Oleg Atbashian, Russian émigré, former KGB propagandist, talented creator of the People’s Cube, now a grateful American citizen finds himself, his words, his satirical art censored in the Land of the Free. No one better understands the corrupt tactics of the kindly, politically correct Powers That Be. He thought all that was behind him when he fled Soviet Russia. Welcome to Progressive America! And who better personifies that noble Progressive crusade than this week’s newly inaugurated Michelle-Antoinette , former NY State Attorney General Eric Schneiderman? Here was the most powerful law enforcement officer in New York, the manically engaged Grand Inquisitor lording it over anyone who didn’t vote for Hillary, a vanguard member of the “Resistance,” the self-righteous friend of every downtrodden Victim Identity group, particularly women and Blacks. And now it turns out that privately he likes “role-playing” the White master beating up his very own Black slave girl. Double whammy, so to speak. If the Left in its many powerful places is intent on changing and re-crafting the meaning of words, we must counter as daily defenders of what we know and have known as their long-agreed upon definitions. The war rages on. Are we up to the fight today and tomorrow and the next day? Words can and do break one’s bones. They are also our salvation.